In January we had flocks of Common Grackles move through, as they do for a day or two each year. There are usually about 1000 birds in the flock, and they swarm like schools of fish, settling for a few minutes, but then swirling up in like volcanic clouds of ash. 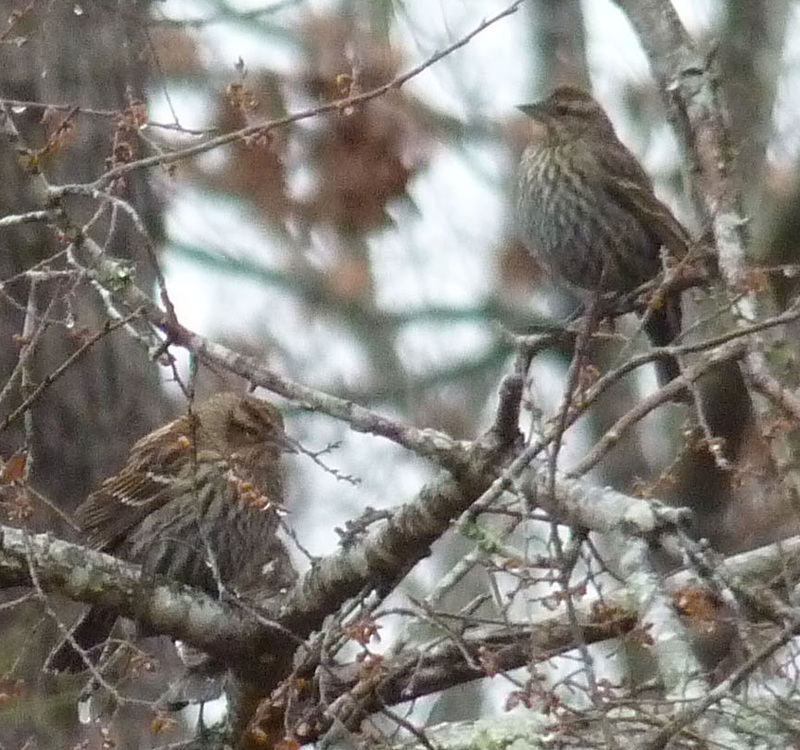 This year, mixed among them were about a dozen Red-Winged Blackbird females. Common Grackles, a regular sight in January. One grackle, with some Red-winged Blackbird females. 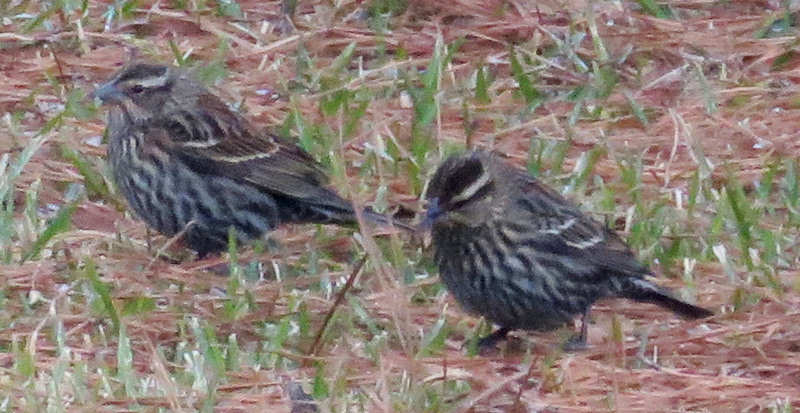 I have gotten pictures of these birds in past years, but as is often the case, I wasn’t able to figure out their identity. I thought they were sparrows or finches, so I was looking in the wrong sections of the guide books. Also, when there is a whole group of birds that look alike, I never remember that I could be looking at a group of female birds. So that was our species #95. Here is a photo I took back in 2012! I am glad I finally figured out this mystery. 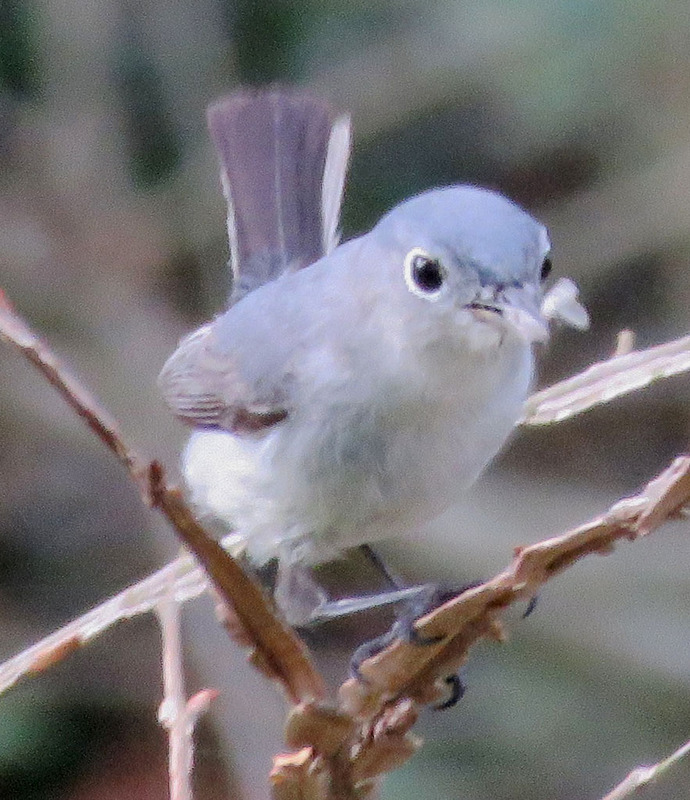 Just a few days ago, I found species #96, this little Blue-Gray Gnatcatcher. 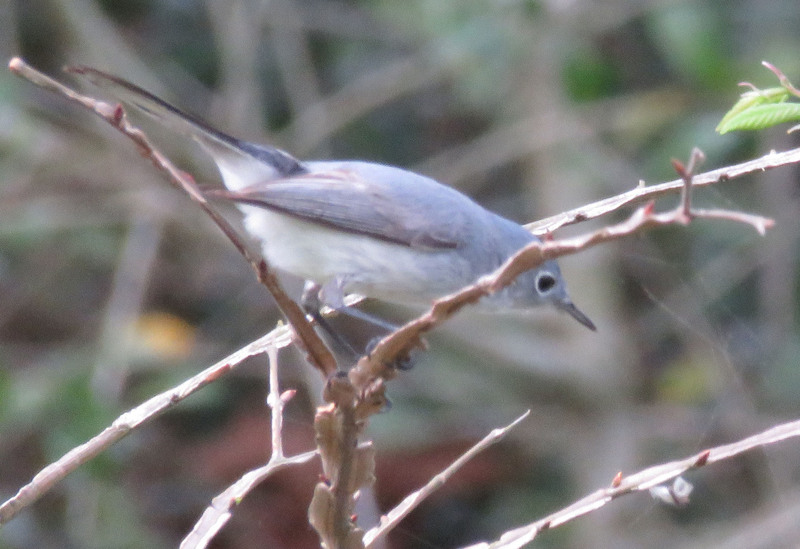 In this case, this is a common bird and I am sure it has been here all along, but if I saw one flitting through the bushes, I probably dismissed it as a Tufted Titmouse. Small birds in muted colors are easy for me to overlook. Blue-gray Gnatcatcher waiting for a bug, possibly a little moth. Here I have circled the bug. The gnatcatcher “gnabs” the bug. I know there are other species that should be here as well, like the White-eyed Vireo, but I have yet to spot one. If I ever manage to get our bird list up to 100 species, I think it will be by noticing and identifying more small birds like this. My “new” dragonfly, though, is one that I have not seen here before. 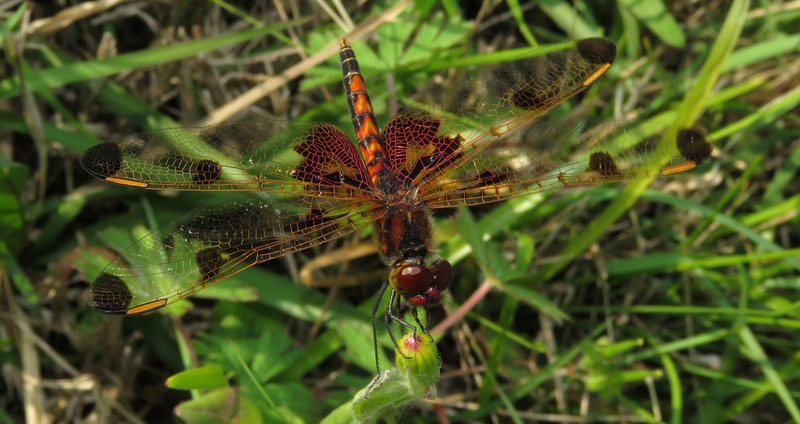 I love its dramatic red and umber coloring, and its textile-related name, Calico Pennant! A close-up of the dramatic patterning. This is another new insect, not quite so pretty. 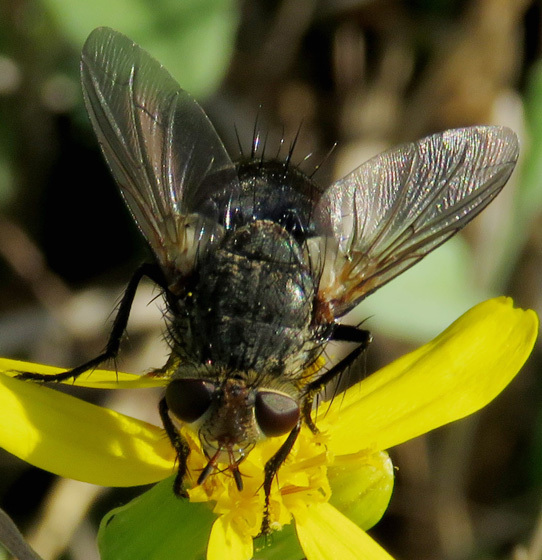 I thought it might be a fly, but otherwise had no idea. The wonderful volunteers at BugGuide.net identified it as a tachnid fly, Archytus marmoratus. 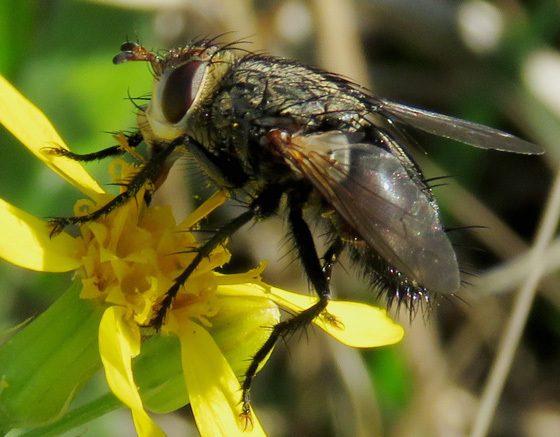 According to the Kaufman Field Guide to Insects of North America, these are parasitic flies, whose larva feed inside a host caterpillar or larva. “Many female tachinids lay eggs directly on the host insect, or forcibly inject them, but some ‘broadcast’ hundreds of tiny eggs on foliage. The ova hatch only if they are consumed (with foliage) by a caterpillar.” (p.308) The BugGuide page says that adults may be seen getting nectar from flowers. I am always happy to add to our lists! 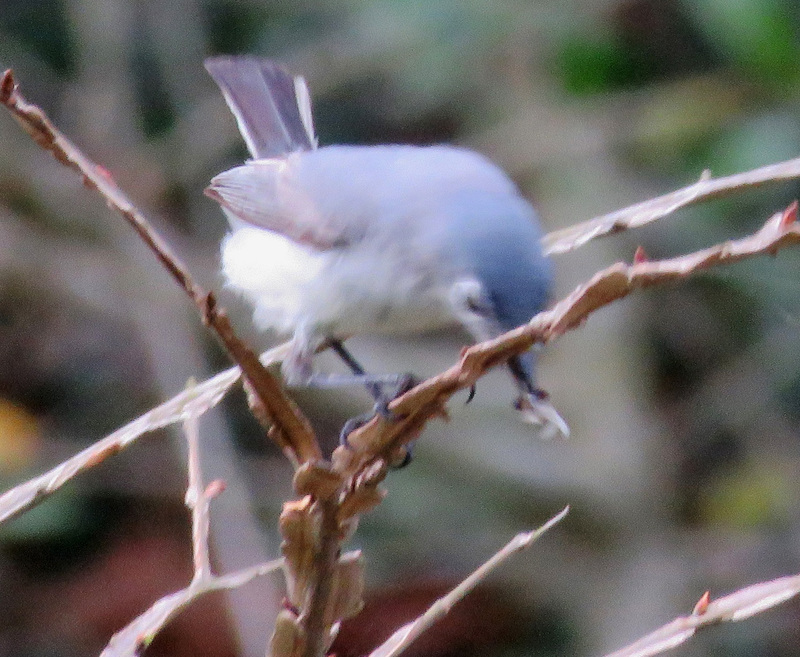 I like the gnatcatcher. It does look like a titmouse. What camera do you use? Good shots. Canon Powershot 60SX, I think that’s what you have too. I have had lots of problems over the years — it always seems to want to focus about 6 inches behind where I am trying to focus, but I must have changed some adjustment lately, because it seems like it is getting sharper images. I need to get a new camera but research is so time-consuming! 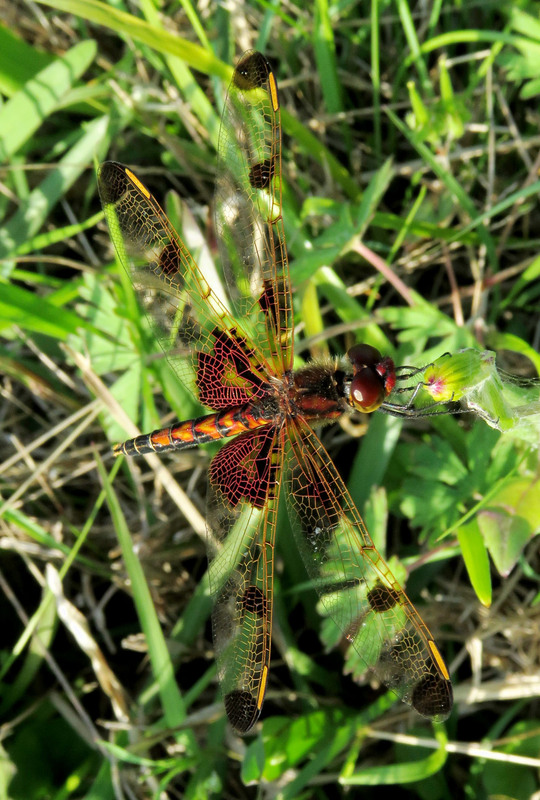 That dragonfly is simply stunning, we have nothing in the UK with wing patterns like that, well caught. Thanks! I was thinking the same about the Banded Demoiselle on your About page — we have Ebony Jewelwings which are similar, but I was thinking how hard it is to capture a damselfly as opposed to the bigger dragonflies, and I was in awe of that picture of yours! I’m with Jim, as usual — the gnatcatcher takes the prize!! 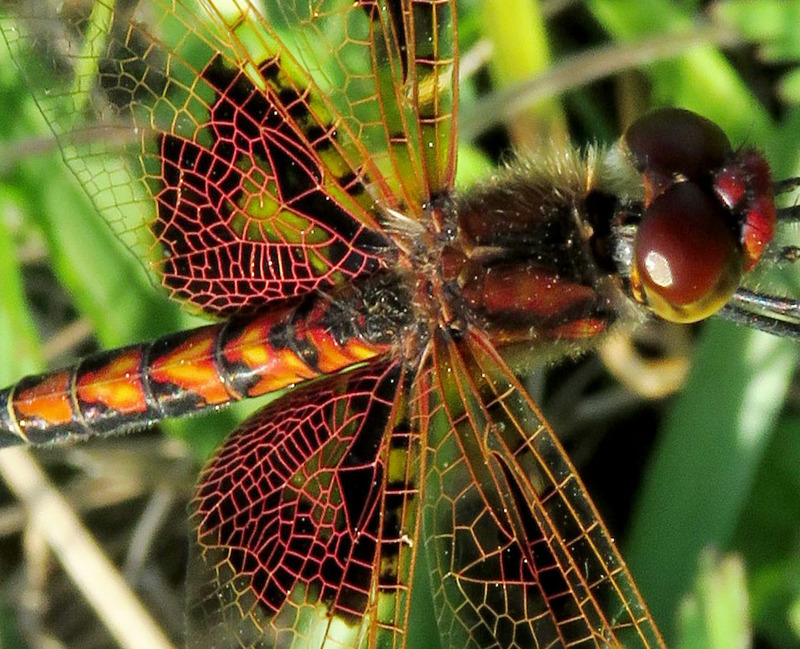 Though the dragonfly is a close second. Thanks as always for sharing your finds with us. It’s fun to join in the adventure. I am so glad to share! Jim probably will, but not necessarily me. 🙂 But thanks so much for the lovely thought. I do sometimes see the moon or the sun and reflect on it being the same moon or sun for all of us.